A model release is a legal document in which the photographed model grants the photographer the permission to photograph and distribute the images of the model under certain conditions (Licensing). Model releases protect the photographer, the model, the agency and the end user from any disagreements that were to arise prior to the distribution of those images. All the adult model release are required to obtain signatures by the model. 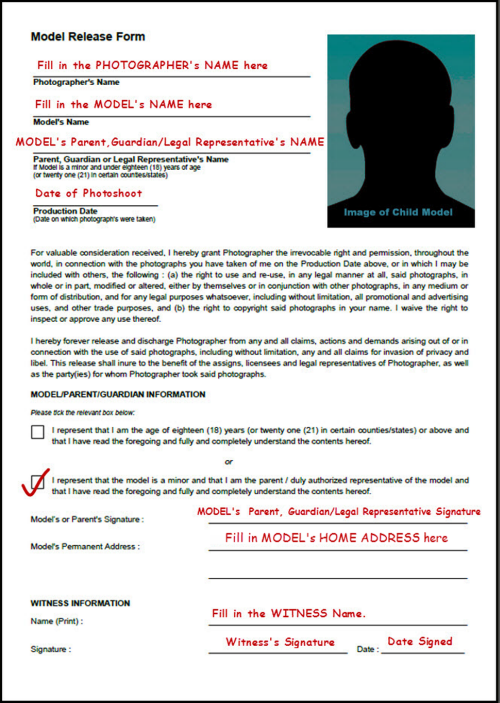 When shooting models below the age limit, you are required to obtain signatures of the legal parent or guardian of the model. Always get a 3rd party to witness the Model Release and endorse the Model Release appropriately. The photographer/model is NOT ALLOWED to sign off as a witness in a Model Release. Please provide the information of the model to the best of your ability. Model Releases serve to protect not only the photographer but also the model and the agency that markets your content. So PLEASE provide truthful information only. A new window will appear and load the Model Release for you. Scroll down. NOTE : Please make sure you have Adobe PDF Reader installed FIRST, if not you can install it for free here. Get Adobe Reader FREE! It would be a good idea to print several copies for personal use at your own leisure. Alternatively, you may also save a copy to your hard disk so that you can print it out later. There are TWO types of Model Releases ; Adult and Minor Model Releases. Please refer to the images below on how to fill in model releases for models. IMPORTANT: If you are going to be the model in your own photo shoot, YOU are also REQUIRED to sign the Model Release too. No exceptions. Photographer’s / Model’s information on Model Releases can also be filled in via computer software programs such as Adobe Photoshop or Microsoft Paint but SIGNATURES of both photographer and model must be via handwriting. Now that you have already filled in the Model Releases for your images (make sure both physical and soft copies of the Model Releases are kept in a safe place), you will have to upload the Model Release(s) into our system. Browse for the Model Release on your computer. Select the Model Release that you want to upload for your images. NOTE : Model Releases are only acceptable in JPG and PDF formats only. Choose the appropriate Type of Release that you are about to upload. For this case, Select “Model” in the drop menu. After attaching the release that you are looking for, key in a name for your release (eg: model_name_date_of_photoshoot.jpg/pdf). You may also key in a description of your model release for your own purposes. Click on “Upload” and the uploading will begin. Now that you’ve already uploaded your releases, here is the fun part. You are just a step away from having the proper releases attached to the respective models of your images. Make sure to have an image of the model in the release, although optional, it is advisable to do so for easy reference on our side. Please refer to the images below to understand better. Go back to “Release” page (refer to STEP 1 on how to get there), you will see that your uploaded Release is now in a table like below. To attach Model Release to your images, click on the checkbox of the model releases that you wish to use. You may check SEVERAL model releases at any time. You will be directed to a new page that shows the status of your “checked release” that you are going to attach to the images of the respective models in your portfolio. Click on the “Open” to make sure that it is readable. Scroll down to the bottom of the page. You will see your image (example image) arranged in a manner that will be easy for you to “check”. To begin, check the “Attach (model-release-name)” and start attaching relevant photographs. 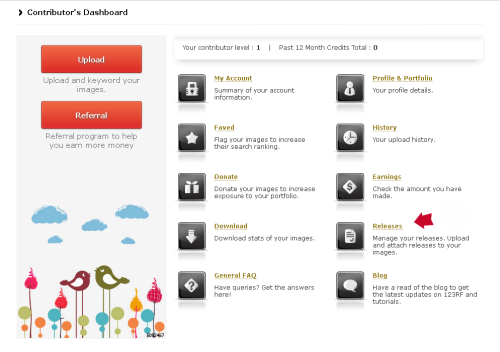 Once checked, your images will have the model release attached to their images respectively. 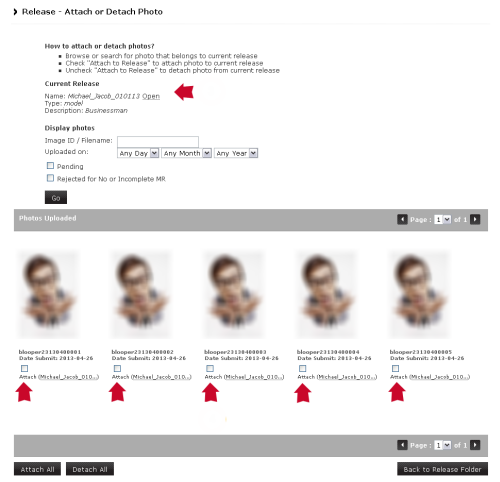 If ALL your images belong to one model in your release, you are allowed to “Attach All” in order to cut down your time by clicking one by one. Make sure that ONE MODEL RELEASE is for ONE MODEL ONLY.